Creamy potato cheese soup is the best crock pot recipe for an easy dinner! This easy Wisconsin cheese soup recipe is a game changer, with jalapenos added for a spicy kick of flavor. It is cheesy goodness at its best, all made easily in your slow cooker. If we go out, I want you to turn to me quite seriously, look deep into eyes and say, “Did you pass through a sieve? Because you are fiiiiiiine.” Or something like it. My lifetime budget for receiving cheesy pick up lines is at a serious deficient. This probably has something to do with my inability to distinguish “adorably awkward” from just plain “awkward” in flirting situations, and something else to do with the fact that I married in my mid-20s, tapping out of the dating game early—not that I was ever particularly “in” it to begin with, but we can pretend for the sake of this post (and my pride). Those of you still in the dating game—going to actual bars where actual interested strangers talk to each other—might (justifiably) feel that having a cheesy pick up line spewed in your direction is more obnoxious than humorous. Perhaps no one even uses them anymore. Regardless of our relationship status, sentiment towards expressions like “Did it hurt when you fell from heaven?” (the one actual cheesy pick up line I can remember a guy saying to me), or if our variety of awkward is “adorable” or “just plain,” we can all use a little extra cheese in our lives, starting with our soup. 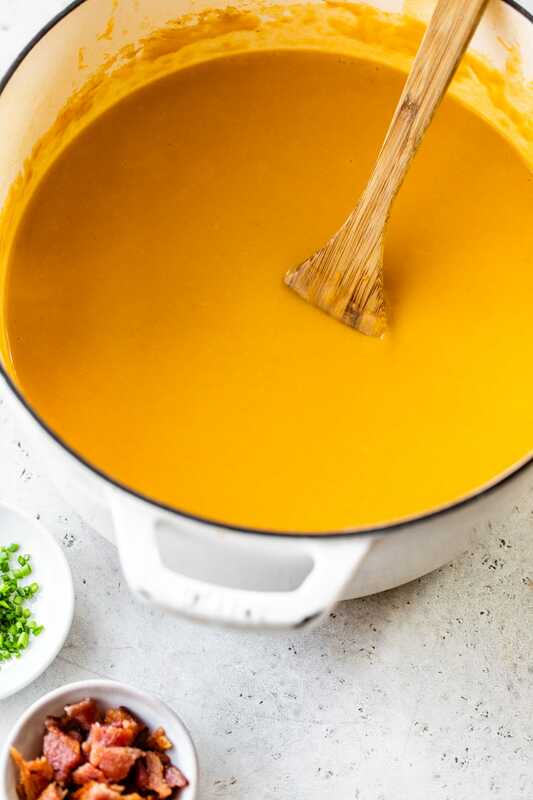 I’m still in winter survival mode, which means hot soup appeals to my cold-weary soul alldayeveryday, but at this point in the season, I’m over carrot (with the exception of this curried carrot soup), and don’t even talk to me about creamy chicken noodle. My soup routine needed a hot night on the town, and this Slow Cooker Jalapeño Cheddar Cheese Soup is the result. 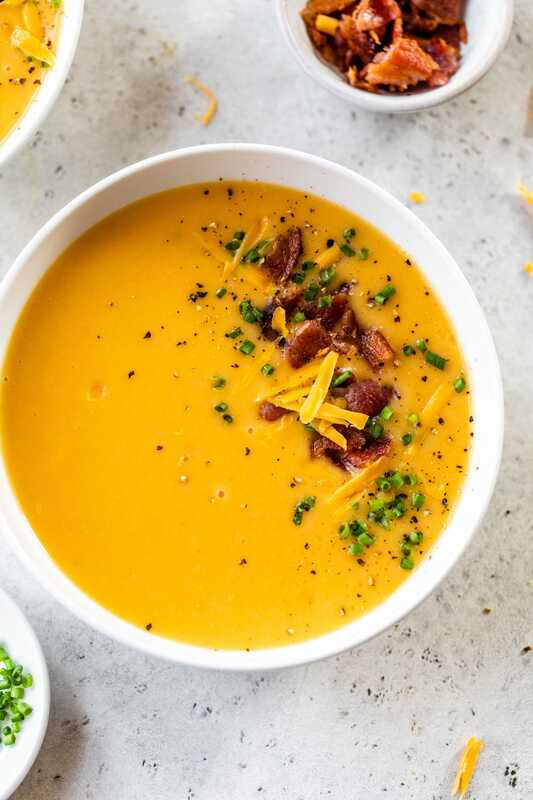 This thick and creamy potato cheddar cheese soup begins as so many great vegetable soups do: onions sautéed with butter, garlic, and love. I added carrots for sweetness and lots of potatoes for thickness and body. (Potatoes also make the soup much healthier than traditional, heavy cream-based cheese soup.) If we left things here, however, it would surely still be December. This is March (March! ), so let’s throw in a handful of jalapeños, hit the pot with some cayenne, and will the snow to melt under their peppery heat. This is a slow cooker cheese soup recipe, so you can return home to its warmth waiting for you like a trusty pair of slippers. Stir in a generous handful of cheese just before serving (dairy-free soups were for January), then serve yourself a steaming bowl. It’s love at first bite. While devouring bowls of this creamy cheese soup by themselves is certainly a fantastic meatless meal by itself, it’s also fantastic served as a side to a roast beef panini, or grilled chicken burgers. Slow Cooker Jalapeno Potato Cheese Soup, are you tired? Because you’ve been running through my mind all day. 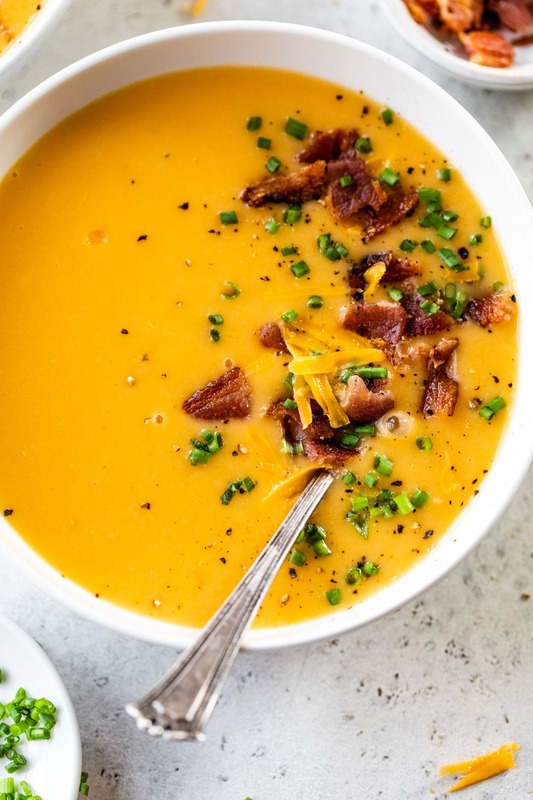 A creamy potato, carrot cheddar cheese soup made in the slow cooker. Add jalapeños for an extra kick! Melt the butter in a large, deep stockpot or Dutch over medium high heat. Add the onion, carrots, and jalapenos and sauté until just beginning to soften, about 5 minutes. Add the garlic, salt, and cayenne pepper and cook the garlic is fragrant, about 30 seconds. Sprinkle the flour over the top of the vegetables, then cook 1 additional minute until lightly golden. Slowly stir in the milk and cook until the mixture thickens, about 2 minutes, stirring constantly. 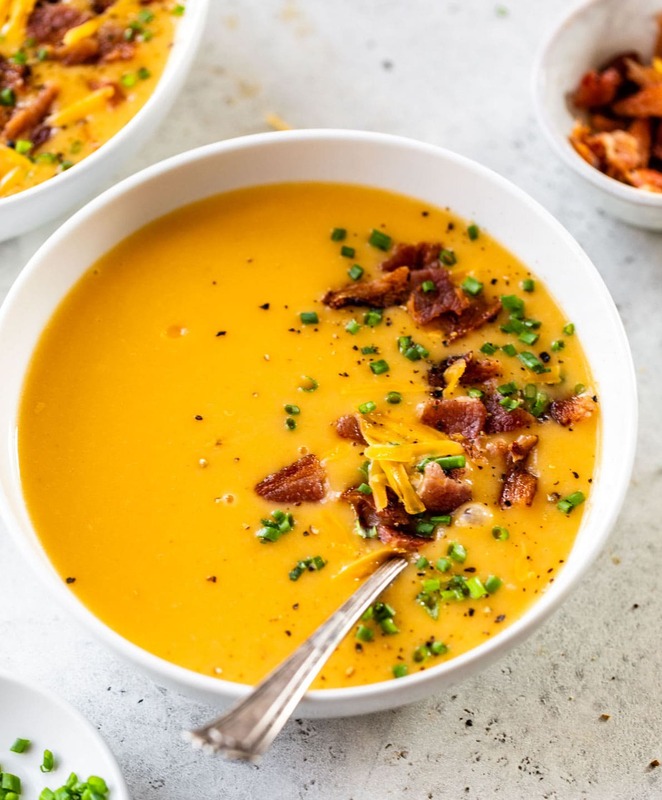 Transfer the soup to a blender or food processor and puree in batches until smooth (alternatively, you can use an immersion blender directly in the slow cooker). Stir in the cheese a half-cup at a time, allowing it to melt completely before stirring in the next half cup. Serve garnished with jalapeño slices, green onions, and additional cheddar cheese. HAHA! I love these cheesy lines. I always wonder the same thing about tapping out of the dating game early. This soup is amazingly creamy and I love that it is healthier than plain old cheese soup. yum! Hey girl- Ha!! Ya pick up lines are so crazy!! That last one some guy told me in a card a long time ago!! I never went out with him though. He gave it to me at a place where I worked!! Girl, if you were a fruit you’d be a fineapple. What the heck?! Maybe I can run on home now and play hooky just so that I can make/devour this soup today? Haha! I tapped out of the dating game fairly early also. I’m thankful to say that I never received any of those cheesy pick up lines. I would have probably laughed in the poor guys face if I had. I would however drop all of those lines on this soup just to get it home with me! But seriously, cheddar soup? Something I should have waaay more often! I love cheesy pickup lines! They’re a nice ice breaker, unless they go too far with the cheese. Then it’s a good, hello I’m walking the other way. lol I generally find it endearing, though! This soup looks delicious!! Love the little kick in it with the jalapeños! Complete comfort food. You would think we would be full on cheese from this past weekend but I’m still wanting more. Uhhhhh YES TO THIS. If someone made me a batch of this soup I might just skip the pickup lines and propose to them on the spot. Sometimes a little cheese is warranted in line and in our food…..This looks (and sounds) phenomenal. This soup sounds amazing right now! Is it spring yet? Also, I love the cheesy pick up lines! mmm, cheesy potato soup, yes please! Love that it’s made in the crock pot! Cheesy heaven! I’m practically jumping into spring, but I can a bowl of this deliciousness! I never got any cheesy pick up lines either. No need though I am already in love with this soup. A little spicy sounds great now. I am all about the soup still too. When will winter end? Oh my, this soup looks delicious! I will be making this very soon! hahaha oh pick-up lines. I’m so glad that I don’t have to deal with the dating game anymore!!! This soup looks sooo good! Perfect for all this cold weather! I can’t even believe how good this looks. SERIOUSLY seriously good. This is so yummy. We’ve had it twice in two weeks already. It was perfect to use up some of the jalapenos from the garden. Thank you for sharing it! Kimmy, that is fantastic, and I especially love that you used your own garden peppers to make it. Thank you so much for letting me know how it turned out! We made this tonight, followed the recipe exactly, and it tastes really good! This was a nice easy recipe that we look forward to making again! James, I am SO happy to hear this! Thanks for taking time to let me know how it turned out for you and for trying it too! Found this recipe on imgur a while back and I made it for a family get together. It was just supposed to be a warm-up appetizer but it was so good some of us, after seconds and thirds, had no room for anything else. Thank you for your lovely website. I want to eat better, healthier, and save some money by cooking at home. This is going to be a big help getting me more comfortable and confident in the kitchen. I’ve bookmarked a folder full of your recipes that I’m excited to try! Alex, I am so incredibly excited to hear that you loved this soup and are being inspired to make other recipes too! It makes my day. I can’t thank you enough for letting me know. Enjoy every bite! So I’ve found this amazing-looking recipe a bit late in the game, but as someone who’s really just starting to cook things seriously, would it ruin the recipe to let it cook longer? My problem is that I’m away nine hours during the day for work, and don’t want it to turn to inedible mush… Really looking forward to trying out my instant pot, though, so I hope it would work! Hi Nerni! If you have a slow cooker that will automatically switch over to “keep warm” instead of staying on full heat, I think it will work fine. I hope you enjoy the recipe! This sounds amazing! Do you know if it would freeze well? Hi Kim! I’ve never tried, but I see no reason why it wouldn’t. I’d suggesting letting the leftovers thaw overnight in the fridge. If they are too thick, reheat gently with a bit of milk or chicken stock to thin the soup back out. I hope you enjoy! Omg…..yumminess!! I have made this multiple times now and always double the recipe! So easy and so tasty! I cook some bacon and crumble it on the soup before serving……mmmmm another level of tasty! Darlene, I’m so glad to hear the recipe is a winner for you! Thanks so much for leaving this awesome review! Erin….question for you just so I know I’m not losing my mind. When you say 1 3/4 cup of cheese, that would be 14 oz correct? A block of 8oz cheese and 3/4 of another? Hi Darlene! Cup measurements are actually by volume, not by weight. 1 cup of coarsely grated cheese weights about 3.5 ounces, so you’d need something more along the lines of 6 ounces. I hope you enjoy the recipe! I loved this soup. I made a couple tweaks by switching 12 oz of dark beer in for some of the chicken broth, adding a rib of celery, one more jalapeño, adding 1/4t of paprika instead of cayenne, and using 1/2 +1/2 instead of milk. Rob, your tweaks sound DELICIOUS! Thanks so much for leaving this wonderful review. I really appreciate it, and it is so helpful for others considering the recipe too! How spicy is this? I am not a huge fan of spicy foods, but I like the flavor when it’s mixed with other things. I’m thinking with the milk and cheese its enough to keep the peppers from being too spicy? Hi Lisa, the soup does have a decent kick to it, so I’d suggest reducing the jalapeno just to be safe! If, after tasting it, you decide you’d like it to be hotter, you can always add more sliced jalapeno on top! What is the approximate serving size? Hi Cory! I didn’t measure this one cup for cup, so you’ll need to estimate.